The Gomti Riverfront Development project, the Agra-Lucknow Expressway, the Jai Prakash Narayan International Centre and the efforts towards the beautification of Old Lucknow are some of Akhilesh Yadav's initiatives that are the subject of investigation. Virendra Singh Rawat reports from Lucknow. In the four months since he was sworn in as the chief minister of Uttar Pradesh, Yogi Adityanath has turned the spotlight on a number of projects announced by his predecessor, Akhilesh Yadav of the Samajwadi Party. Under scrutiny are projects worth crores of rupees for alleged irregularities and escalated costs. The Gomti Riverfront Development project, the Agra-Lucknow Expressway, the Jai Prakash Narayan International Centre and the efforts towards the beautification of Old Lucknow are just some of Yadav's key initiatives that are today the subject of intense investigation. In the line of fire are senior bureaucrats, some of whom have been suspended, while investigation has been ordered against others on charges of corruption. Besides these, the sale of 21 government-owned sugar mills during the Mayawati regime (2007 to 2012), allegedly at throwaway prices, is also being investigated. A departmental inquiry into the sale during 2010-2011 was ordered in April, and the state government has maintained it would not shy away from recommending an investigation by the Central Bureau of Investigation if needed. Recently, the Yogi government also recommended an audit by the Comptroller and Auditor General of the cash-rich development authorities of Noida, Greater Noida, Yamuna Expressway and Uttar Pradesh State Industrial Development Corporation following allegations of kickbacks and corruption in land deals. Launched in 2014, the project was inaugurated by Akhilesh Yadav in November 2016 in the run-up to the 2017 UP election before the model code of conduct kicked in. The Gomti riverfront, the development of which was estimated to cost Rs 1,500 crore (Rs 15 billion), was still only about half ready when an additional Rs 1,500 crore was requisitioned. This would have effectively increased its total cost to Rs 3,000 crore (Rs 30 billion). When Yadav was the chief minister, the then state irrigation and public works department minister, Shivpal Singh Yadav, and irrigation department principal secretary, Deepak Singhal, visited Japan to study riverfront developments in Tokyo and Osaka. Later, the Samajwadi Party government had mandated the UP irrigation and water resources department as the nodal agency to rejuvenate the Gomti and develop a world-class riverfront. 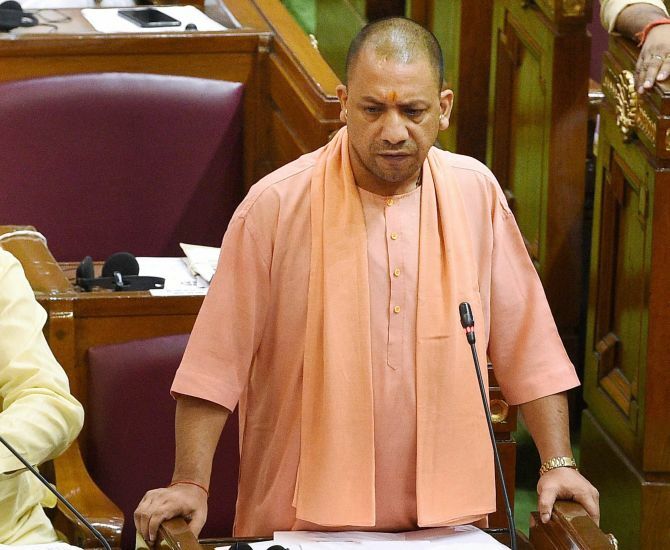 After conducting a spot inspection of the project, Adityanath expressed dismay over the alleged 100 per cent cost overrun. He then instituted a committee, headed by Justice (retired) Alok Kumar Singh, to look into the alleged irregularities into the multi-crore project. In its report, the committee indicted then chief secretary Alok Ranjan, Deepak Singhal and other senior officials for their purported neglect, lack of transparency and misappropriation of funds in awarding contracts. The officials were also charged with facilitating tenders to select firms, arbitrarily fixing rates for tender and exhibiting apathy towards environmental issues. The report observed that the Gomti riverfront project was riddled with environmental issues and cost overruns, besides having concept and design errors. Later, the Adityanath government constituted a high-level committee to study the recommendations of the Justice Singh report, so that charges could be framed and action taken. It was chaired by UP cabinet Minister Suresh Khanna and included Revenue Board Chairman Pravir Kumar, Additional Chief Secretary (finance) Anup Chandra Pandey and Principal Secretary (law and justice) Rangnath Mishra as members. In its report, the committee fixed the blame on some bureaucrats and officials for the alleged lapses. The expressway, estimated at Rs 15,000 crore (Rs 150 billion), was inaugurated by Akhilesh Yadav with much fanfare on November 21, 2016, in the presence of his father Mulayam Singh Yadav, then the Samajwadi Party president. The six-lane expressway, extendable to eight lanes, traverses 10 districts: Agra, Firozabad, Mainpuri, Etawah, Auraiya, Kannauj, KanpurCity, Unnao, Hardoi and Lucknow. It is aimed at providing seamless connectivity between Lucknow and Agra via the already operational Yamuna Expressway. The expressway, which is still incomplete, is under scrutiny for an alleged scam involving farmland passed off as residential land to fetch higher compensation. The state government has directed the respective district magistrates to probe all big land deals over the last two years. Besides, a central agency has also been commissioned for a thorough technical survey and field audit of the expressway. A field officer of the UP Expressways Industrial Development Authority filed a police case in Firozabad district against chakbandi (land consolidation) officers and land owners charging them with passing off their agricultural land as residential land. Bharatiya Janata Party President Amit Shah has on numerous occasions asserted that the cost of building the expressway was much higher than the cost incurred by the National Highways Authority of India and stressed the need for a thorough probe to expose the alleged wrongdoing. Around 3,500 hectares of land was purchased from about 20,500 farmers spanning 10 districts for this project. A vigilance department investigation was ordered against senior Indian Administrative Service officer Amit Ghosh for alleged financial irregularities in the awarding of tenders while serving as the UP State Industrial Development Corporation managing director. Ghosh was alleged to have been involved in the embezzlement of public funds in awarding contracts worth Rs 1,100 crore (Rs 11 billion) in the Trans-GangaCity (Kanpur) and Saraswati Hi-tech City (Allahabad) projects. Ghosh was posted as the MD of UPSIDC on August 2, 2016 by Akhilesh Yadav, but was removed by the Adityanath government on April 14, 2017. An investigation was ordered on a complaint by UPSIDC Chief Engineer Arun Mishra, who, interestingly, is himself facing a CBI probe for corruption. The two officials have been trading charges. A museum in Old Lucknow's Hussainabad area and the re-development of the adjoining area for which Akhilesh laid the foundation on December 4, 2016 -- weeks before the model code of conduct was enforced in UP. The Jai Prakash Narayan International Centre, the blueprint of which includes a museum, guest house, aquatic block with world-class swimming and diving pools, convention centre and sports complex. The Lucknow International Cricket Stadium: A report on it has been sought from the UP sports department. An inquiry is on into civil works executed under the Jawaharlal Nehru National Urban Renewal Mission under Akhilesh. Launched in 2005 by the Manmohan Singh government at the Centre, the JNNURM was aimed at improving urban infrastructure in India. The Narendra Modi government has rechristened it the Atal Mission for Rejuvenation and Urban Transformation. The CBI is already investigating the alleged mining scam in UP with regards to unauthorised and unbridled mining of sand and other minerals from the riverbeds, especially in the Bundelkhand region.